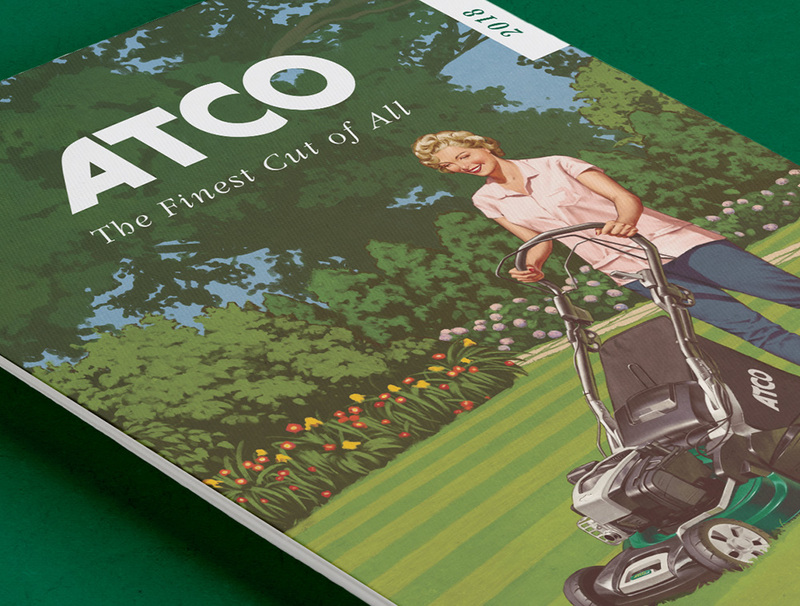 Known for its stripes, Atco has been making precision lawnmowers since 1921. 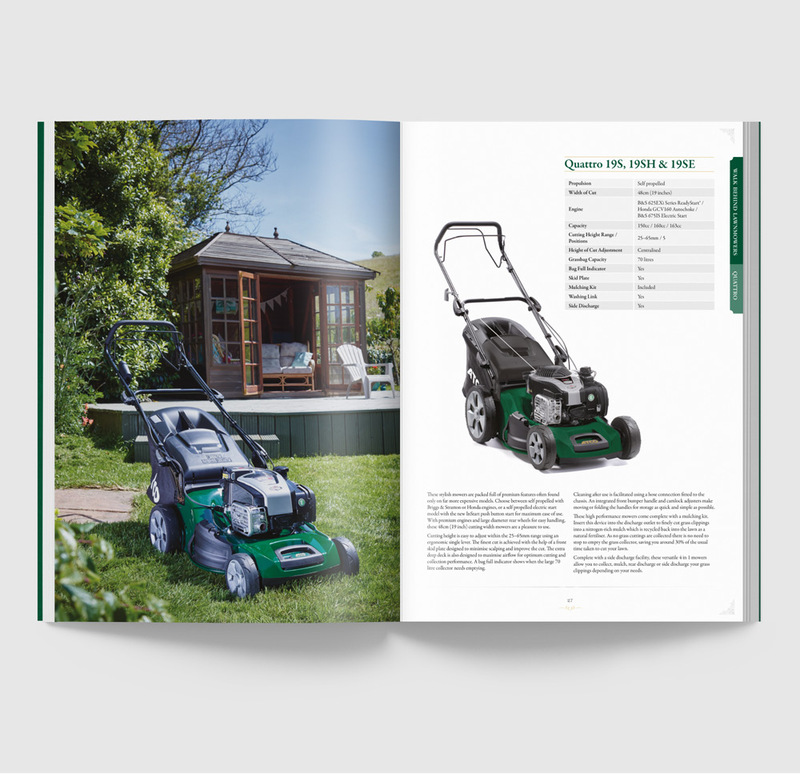 For its 2018 marketing campaign, Drive worked with this renowned British manufacturer to produce some very special advertising, promotion and a suite of printed collateral. 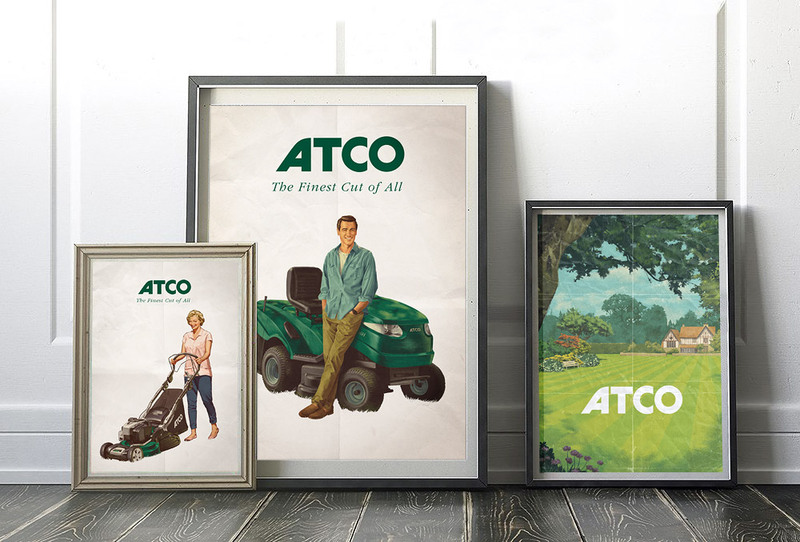 We developed a concept that drew on Atco’s ‘long history of keeping it short’: drawing upon its 1920s-60s advertising, we paid homage to the brand’s heritage, producing authentic-looking, vintage-illustrated adverts with a modern twist. 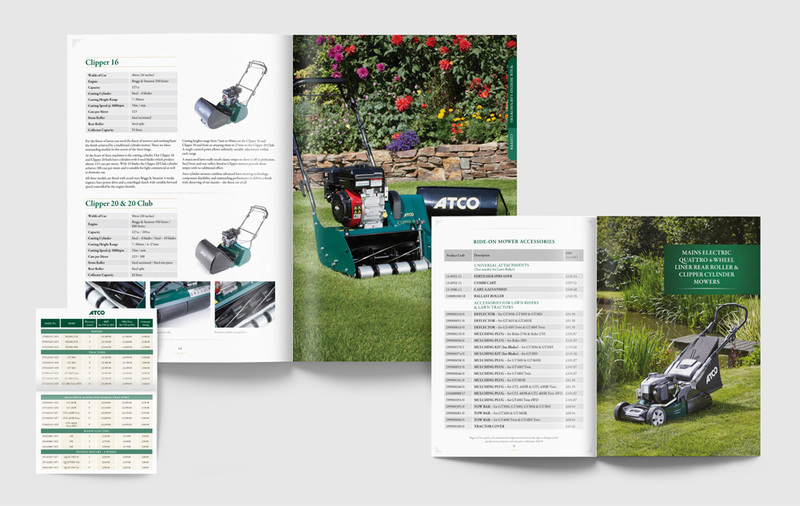 Sporting a playful, classic look, garden enthusiasts will notice that all the products are modern, top-of-the-line machines, which incorporate the latest in mower technology. 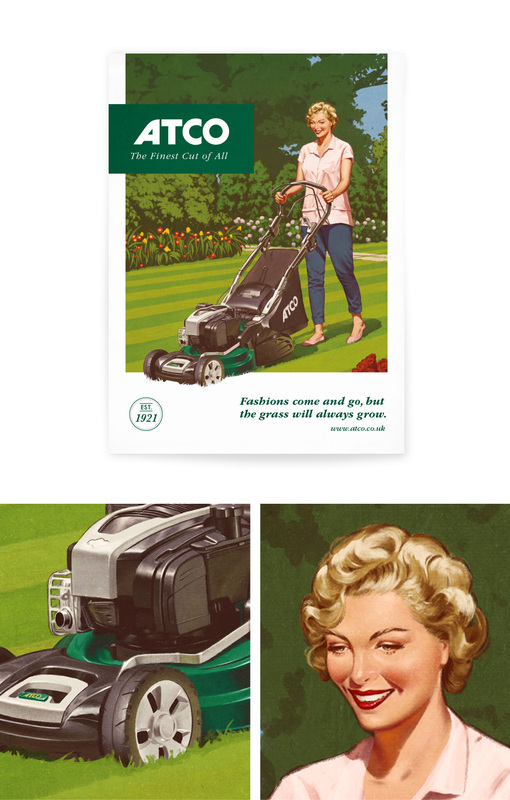 Advert taglines, such as ‘fashions come and go, but the grass will always grow’, were written to playfully tie together the mix of new and old in the image. 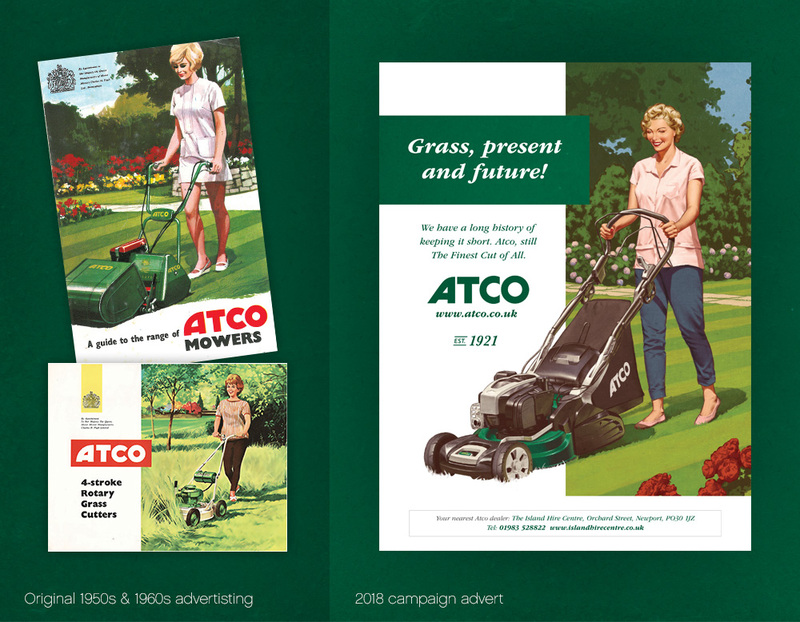 This tongue-in-cheek blend of modern yet vintage imagery was then also used on an extensive range of 2018 product brochures and marketing materials. 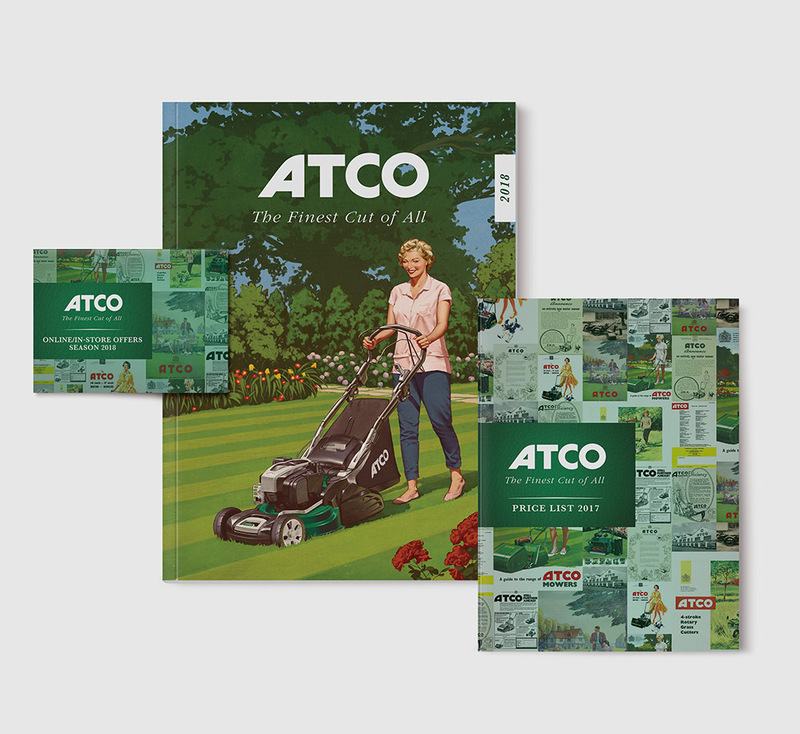 The comprehensive brochure was PUR bound and printed on an uncoated stock with a white foil block logo; the texture adding to the vintage-inspired experience. 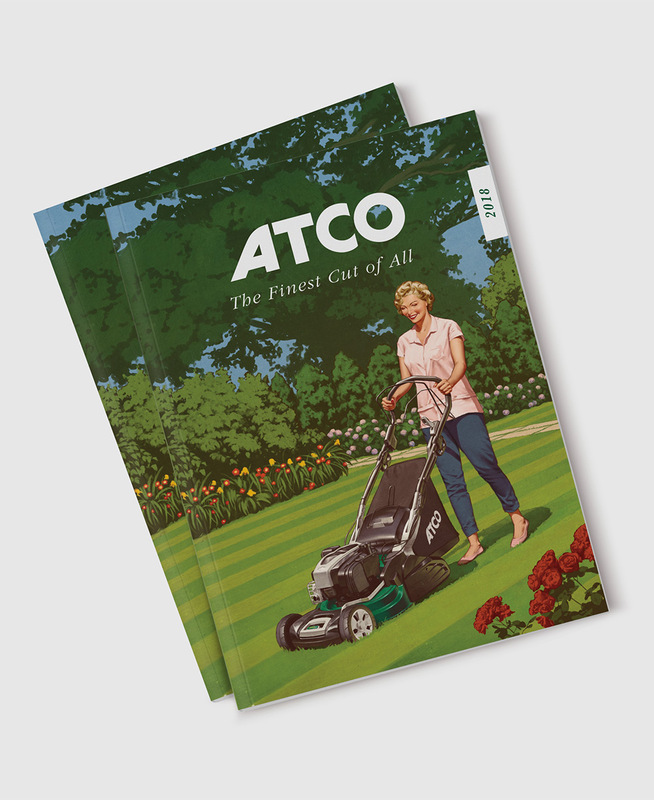 Other marketing materials – from small A7 price lists, posters and point of sale, through to 4m-long banners for dealer showrooms – feature a montage of genuine vintage Atco adverts ghosted behind the logo, presenting the extensive heritage of the brand alongside its current output. 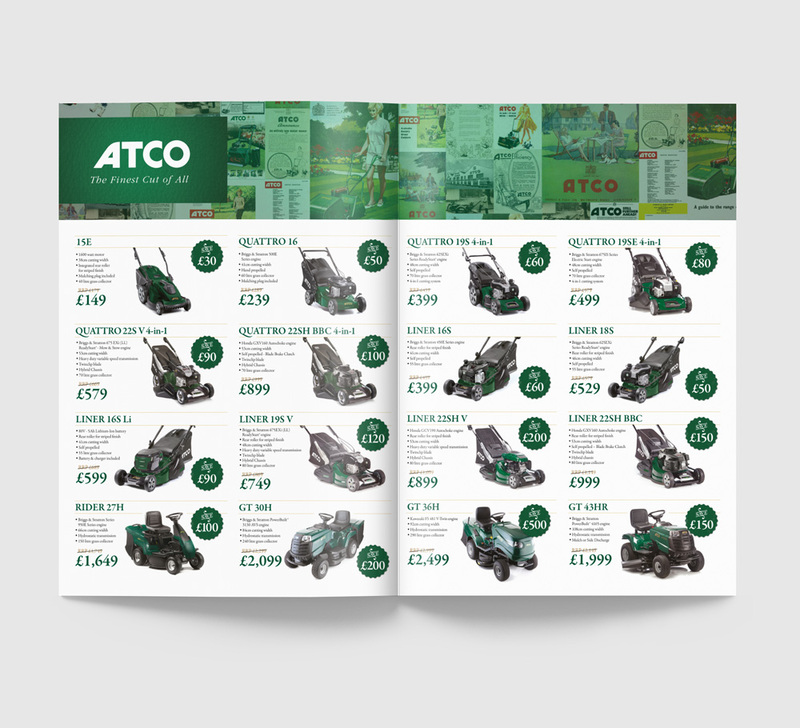 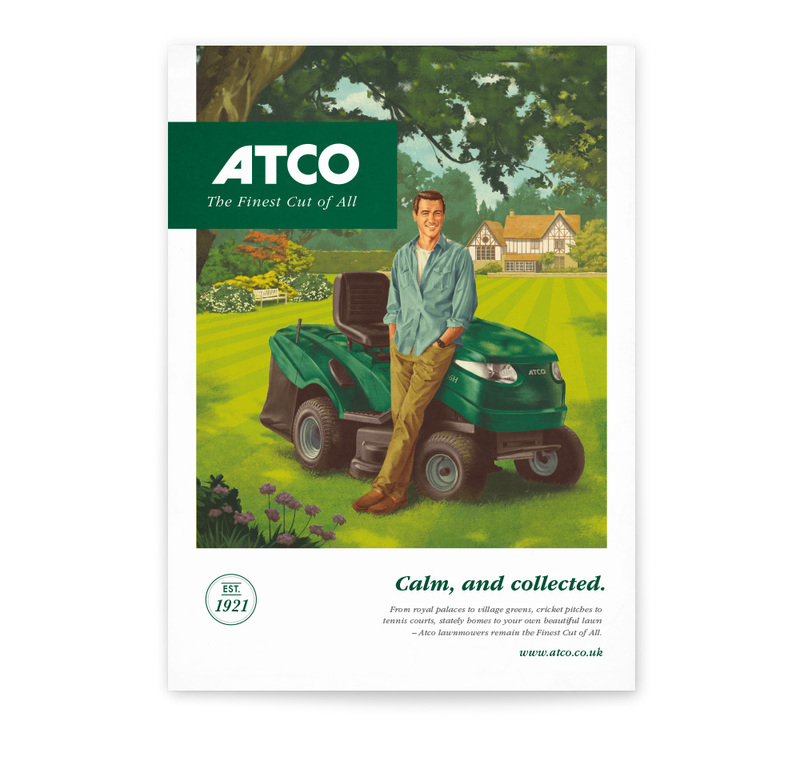 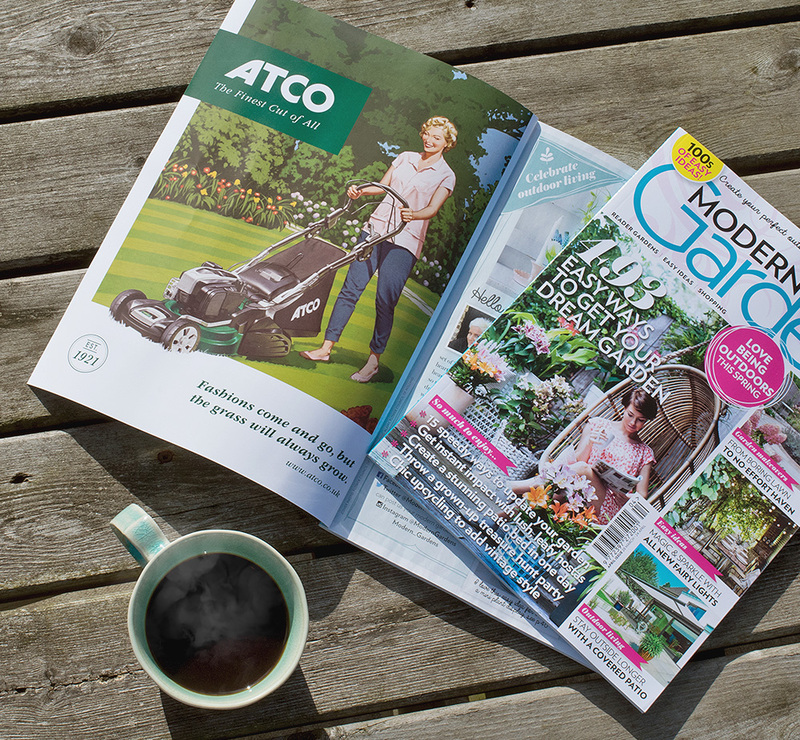 The result was a suite of print and advertising work with the appeal of a premium collector’s edition – honouring the history of the brand that produced the world’s first truly mass-produced motor mower, and reflecting the quality, assurance and technological excellence that Atco offers today.